I just found out today that my novel Rain Dogs has been shortlisted for the 2017 Barry Award for Best Crime Novel of the year (paperback original). I am very honoured to be nominated and I would like to thank the jury for thinking of me and shortlisting the book. Rain Dogs is the fifth of my Sean Duffy novels and I guess its the one where I finally got everything right, judging from the impact its been having! 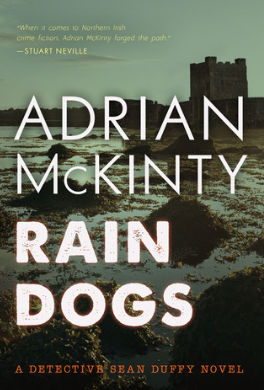 In case you don't know: Rain Dogs is a locked room mystery (more of a locked castle really) that takes place during the Northern Irish Troubles in 1987 featuring my copper, RUC Detective Inspector Sean Duffy and his comrades in arms. Rain Dogs has also been shortlisted for the 2016 Ned Kelly Award, the 2016 Theakston Crime Novel of the Year Award, the 2016 (Steel) Dagger Award and of course the 2017 Edgar Award (best pbk original). So far I'm 0/3 in the big prizes. I didn't win the Ned Kelly, or the Theakston or the Dagger but I'm still in with a shot of an Edgar and of course the Barry. Rain Dogs is the only book that I know of to have been shortlisted for five major crime fiction awards. Many thanks to everyone who has somehow found this book which came out with little fanfare in a limited edition with 2 tiny presses. You, the readers, have kept me going with your emails and tweets and letters and I wd long ago have given up writing, period, if it hadn't been for your support.